( 1 ) Gift certificate must be presented prior to placing order. ( 2 ) Good for a single dine-in visit only. Unused value cannot carry over to another purchase. ( 3 ) Expires one year from date of purchase. 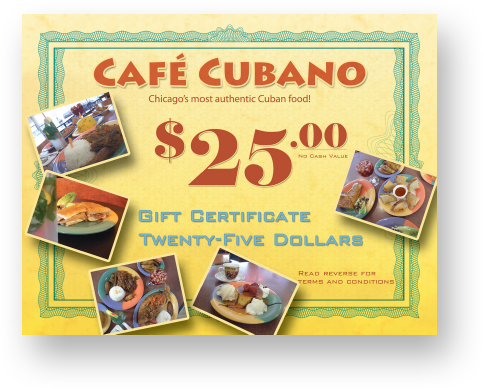 ( 4 ) One gift certificate per table. No split check. ( 5 ) Not exchangeable for cash. ( 6 ) No refund. ( 7 ) No replacement if lost. ( 8 ) Photocopy or duplicate not accepted. ( 9 ) Gratuity of 18% will be added to check. ( 10 ) Taxes not included.